You’re Going to Need a Diaper Pail, period! This is another must have for parents. I have no idea how people do it without one of these amazing things. This is one of the unsung heroes of baby supplies. Of course poopy diapers are not something most people like to talk about, and rightfully so, I get it, but it does have to be addressed, especially for new parents. If you’re not careful parts of your house will start to smell really bad, and this magical little pail will be the wizard behind the curtain keeping your house order free, or at least to a minimum, and no one will notice it. It just sits behind the scenes doing it’s job and reducing your work. The dirty job that you always worry about is dramatically reduced with the help of this diaper pail. If you haven’t figured out by now I love this thing. I will be mentioning in various posts how helpful some products are. And other products deserve their moment on the runway, they’re that helpful. A good diaper pail is one of those products. I recommend this one, but I’m sure others work just as well. I’ve tried a couple and I like this one. These things are really simple and function well. Low maintenance and high performing. How can you go wrong I ask you? This is one of those things you can't live without, and if you did, once you get one, you'll wonder how you lived without it before. New Playtex Diaper Genie Expressions - the only customizable diaper disposal system that lets you choose a design that fits you and your nursery decor while providing maximum odor control. Playtex Diaper Genie Expressions diaper pail can be kept white for a sleek look or you can choose from a wide variety of designer fabric sleeves to match your decor. 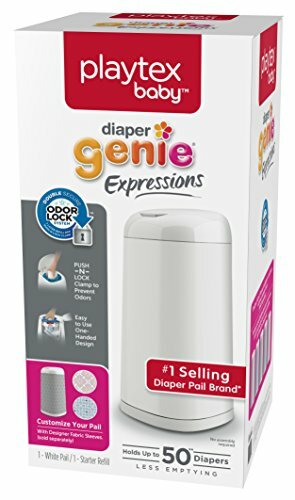 NEW Diaper Genie Expressions™ - Customizable!